I remember, when watching 15 Minutes back in 2001, thinking Vera Farmiga was an interesting foreigner playing quite well off of Ed Burns and Robert De Niro. Sadly, until five years later with a spate of high profile films leading to the A-list status she now holds, I still thought it despite her being born in New Jersey. As a result, I had no knowledge of the independent film Down to the Bone—a Sundance-winning piece for both her and director Debra Granik amongst a slew of other nominations on the festival circuit—the true reason for her rapid ascent in Hollywood. Yes, there are many films dealing with drugs and addiction, mostly spring-boarding stylistic artistry off the kinetic/slomotion roller coasters associated with the habit. Few, however, allow themselves to delve into an addict’s upside-down world for an up-close-and-personal view. Requiem for a Dream melds the two schools; Trainspotting shows how style alone can excel; and even a film like Rachel Getting Married subtly infuses its blanket effect on one’s life. Granik’s debut goes for the vérité look, utilizing Farmiga’s performance to paint the exact depths necessary to plummet before even beginning to lift oneself up. It all started seven years previous with the short film Snake Feed, directed and cowritten by Granik. I haven’t seen the movie, but from the inclusion of the titular reptile in Down to the Bone, I can see the metaphor porting over into the feature version. Farmiga’s Irene has allowed the devil that is cocaine to overtake her entire existence. Working a dead-end job as a supermarket cashier, coming home to two young boys and a husband who tries to stop her habit by using their money to remodel the house—as well as buy pot—she looks for any opportunity to hide and snort what she can. The bottom comes quickly as the Halloween season brings her to the point of no drugs and no money to acquire more. After cutting her coke straw to lick whatever granules stuck to its inside, Irene knocks on her supplier’s door late at night, after having been denied an ‘advance’ earlier, with her son’s birthday check; kudos to the drug-dealer for refusing to let her become that person, hocking her child’s happiness for her own escape. All the kid wanted was a pet snake, something she nixed due to the costs of tanks and heat lamps, all while leaving the pet shop to score more powder while her sons waited in the car. The whole endeavor of living with the drug looming high, controlling your every move, is much like a snake feed. Helpless to get up, the addiction pounces effortlessly, coiling itself around you, suffocating any attempts to stop it as your breathing slows and the quiet floods over. No matter how gentle the beast is, never biting its handler and pulling away when flesh is placed at its mouth, the snake will never pass up an opportunity for the kill. And that is why kicking the habit is so hard. Irene has tried and failed before, but this time is different. She can say she’s doing it for the kids, but it really is for herself. She is no longer able to live with the fact cocaine has been consistently placing first over all other aspects in her life. It’s time for a change starting with rehab, even if only for a week—she can’t spend more than that off of work. Hugh Dillon’s Bob makes things easier, befriending her as both the male nurse on duty and as a reformed addict himself, lending his services as a helpful hand. But your own strength is all you can count on. When you cook Thanksgiving dinner for friends and family, only to see a dealer at the door sell to one, and watching them cut it on the table—with your husband, Clint Jordan’s Steve—it can get to be too much. Granik has an eye and feel for letting the actors run with the material and do their thing onscreen. Jordan is great as the caring husband with his own unsavory addictions, albeit tame in comparison to his wife; Dillon excels as the recovered junkie unable to stay sober once a woman enters his life and stimulates his libido—how can he enjoy her completely without taking a ride on the H-train again? But the film really does revolve around Farmiga’s portrayal of Irene. Granik shows her during the good times, the bad, and all those ups and downs in between. She is an attractive woman with two well-behaved boys at home who know they are watching their mother disappear second by second. Each injection of drug, whether the coke, her boys’ happiness, or sexual arousal from Dillon, takes control of her body, inhabiting her every expression, movement, and sound. Even those blank stares and short temper with the litany of grocery customers resonates with complete authenticity; we watch her withering away. No matter how much love is at home, though, Steve won’t stop his own drug use; no matter how great life is with Bob, his ability to lie and watch her slip back can’t be forgotten. Irene can only survive if she wants to. Obviously shot on the cheap and handheld, we see most of the action close-up. 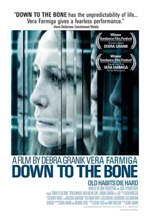 Down to the Bone becomes an edited together mix of moments full of emotion. Shots linger on faces of heartbreak and defeat; you believe these actors are caught up in this world, living day by day, fully knowing that the next could be the one of no return. It becomes a question of what will make you stop. When will the stakes get too high to roll the dice one more time? Knowing that Granik used many locals from the Ozarks for her sophomore gem Winter’s Bone, I wouldn’t be surprised if the other Narcotics Anonymous members are in fact real addicts here. Their actions and mannerisms speak volumes to the crushing weight addiction inflicts and Farmiga and company squeeze right in as though they’ve been users their entire life and Granik is merely filming reality. This film may not give you easy answers; it may not even show whether Irene’s strides to survive and be a mother to her children work. What it does tell is one woman’s journey to hell and back, finding a glimpse of hope with kindred spirits and friends who understand exactly what it is she is going through. While the success of rehabilitation may be yours and yours alone, the path to that revelation doesn’t have to be a lonely road. Jared, thanks, for this–I believe it’s the most extended examination Down To The Bone has received in several years. You’re guess regarding the NA scene cast is correct–they were recovering addicts who had chosen to re-enact an earlier stage of their recovery process, and the counselor, like the public defender, was performing her real-life role. In Winter’s Bone there’s a scene with a Army recruiter that was filmed using the same technique. I appreciate the kind words, I’m glad to have finally caught the film. I did so due to an interview opportunity with Debra Granik today, which I just finished, and saw DTTB on Netflix Instant so had to watch last night. She actually talked about the Army recruiter and public defender too, and what they brought to the scenes, that authenticity.